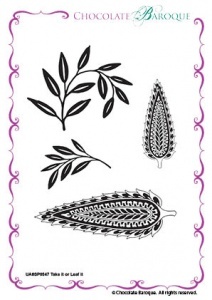 This A6 unmounted stamp sets contains 2 leaf designs in two sizes. Excellent for adding to other floral stamps or can be used alone to create backgrounds and feature toppers. Works in conjunction with our Useful Leaves Stencil. Largest stamp measures approximately 90mm x 38 mm (3.5" x 1.4") and the smallest measures approximately 40mm x 38mm (1.5" x 1.4").